Big Daddy & the Hobbit. 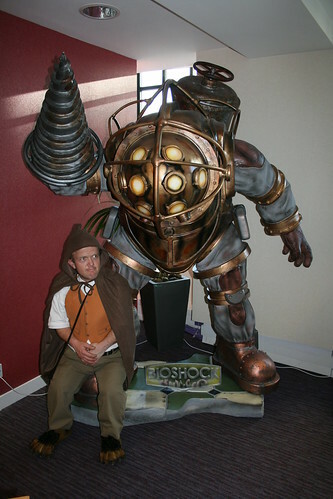 Big Daddy & the Hobbit., originally uploaded by Hot Grill. I’m already having one of the most stressful days of my life, when the phone on my desk rings and our imperturbable elderly receptionist says “there’s someone to see you” in dulcet tones that sound like she got sleeping sickness in 1920 and is just getting around to waking up. (She is *lovely* though.) At which point I remember that the also-lovely, batshit mental Lunch PR team were meant to be sending someone over to see me, though they wouldn’t say who. So, leaving my oft-interrupted writing with a rueful glance, I grabbed the lift down and emerging from the darkened corridor I saw a small figure in a pointy brown cape… “Oh no”, thinks my stressed, tired brain “They can’t have. They wouldn’t. Not in this day and age. ” A look at the serried smiling faces of the PR team, laden down with cupcakes convinced me they had. Not a famous one, not one in character, just a normal dwarf. Dressed as a hobbit. what was the perrian actually there for?and what happened to your ram raider post?